Recent examples of student research include projects on the genetics of aging, the impact of a high salt diet on hypertension, the organic production of blueberries, and methods of tracking coconut rhinoceros beetles to their breeding sites. The primary objective of the biology department is to provide courses and skill training required by students earning B.A. or B.S. degrees, especially those majoring in biology. Additionally, it emphasizes preparing students for graduate training in medicine, dentistry, veterinary sciences, clinical laboratory science, and allied health fields; teaching biology in secondary schools; sustainable agriculture; environmental science; and graduate work in other fields of biology. Careers in Biology include medical technologist, physician, dentist, physical therapist, environmental consultant, genetic counselor, veterinarian, biotechnologist, epidemiologist, pathologist, wildlife biologist, international agriculture consultant, immunologist, and middle or high school teacher. Biology majors interested in biomedicine enroll in PPHS, which is designed for students anticipating entrance into a professional health science school such as medicine, dentistry, veterinary medicine, physical therapy, exercise physiology, occupational therapy, optometry, podiatry, osteopathy, or graduate education and research in any area of biomedicine. Whereas most of the students in this program are biology majors, it is possible to major in chemistry, mathematics or another area in the liberal arts and succeeds in the program if the required courses are completed within another major. Since course requirements for non-biology majors vary, students should check with their major department for specific details. Because graduate schools value a broad education, a minor in a non-science area of interest is suggested. This program will prepare students to teach biology by instructing them in the standards of the National Science Teachers Association (NSTA).The courses listed in the biology major and the secondary education courses make up the program for teacher licensure, grades 6-12. The environmental sustainability major focuses on an interdisciplinary approach to sustaining the quality of our natural world, with an emphasis on the interrelationships between the natural world and humanity. The environmental sustainability major at EMU is designed around an understanding that effectively addressing the pressing environmental problems of our times demands a multifaceted approach that requires both depths in an area of focus and breadth in understanding the perspectives of different disciplines. Students gain depth by choosing to concentrate on either natural science or social science aspects of environmental sustainability. Students gain breadth through coursework that combines essential elements from social science and from natural science to bring a holistic and integrated perspective to complex social and environmental issues pertaining to sustainability. In addition, the environmental sustainability curriculum recognizes a balance between technical training and the broad education of a liberal arts philosophy. Completion of the environmental sustainability major equips students to work in fields of conservation, environmental monitoring, agriculture, international development, alternative energy promotion and development, sustainable development, agricultural extension, environmental advocacy, and environmental education. In addition, the curriculum prepares students for graduate work in many areas related to sustainability. The curriculum for environmental sustainability is conceptualized as three stages. Students from both concentrations begin their coursework together in two introductory courses which set the foundation for further work. Students then take a set of required and elective courses in their chosen concentration that gives depth in their area of focus, plus elective coursework in the alternative concentration which gives breadth to their understanding of sustainability. Finally, students from both concentrations come back together in a series of three courses that serve to integrate the natural science and social science perspectives of sustainability. A major in clinical laboratory science consists of the 37 SH listed below followed by completion of the clinical program (usually one year) in an approved school of clinical laboratory science/medical technology. In this program, the student completes three years of study (a minimum of 96 SH) at Eastern Mennonite University and a fourth year at the school of clinical laboratory science/medical technology. EMU has articulation agreements with Clinical Laboratory Science programs at Sentara RMH Medical Center, Augusta Health Center, and Virginia Commonwealth University. Alternatively, a student may elect to complete the biology major and enter the clinical program following receipt of the baccalaureate degree. 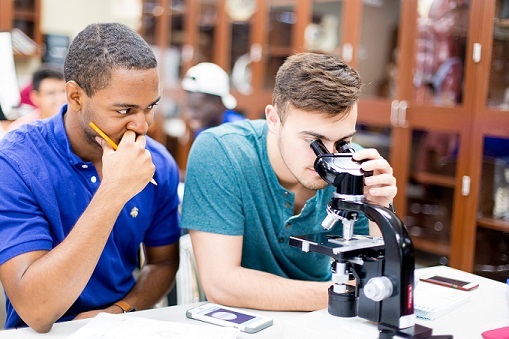 A non-biology major may earn a minor in biology by taking at least 18 SH of biology courses. Because students of other majors will have a variety of reasons for desiring a biology minor, a fixed sequence of courses is not specified. However, two courses must be at the 300 or 400 level and up to two courses may be labeled as ENVS or BIOCH. Students are urged to consult with a biology faculty member in outlining a minor. Our school’s small size means ready access to equipment and individual instruction. Professors who are mentors help you develop skills in scientific interpretation and an awareness of the ethical issues that surround science. They emphasize the harmony between the natural world and God’s Word. Biology is one of the biggest programs at EMU because we have an excellent reputation. Our graduates are sought both by graduate schools and employers – they know EMU biology grads are well-prepared critical thinkers with real-world experience. At EMU we believe that participation in original research projects is an important means of teaching scientific process and critical thinking skills. Biology majors participate in faculty-led research projects as a means of learning by doing. Often students choose a specific project that falls within a larger, ongoing, research project in the laboratory of a faculty member. Students meet on a regular basis with faculty to discuss progress, and sometimes get together with other research groups to exchange ideas. In some cases, research results lead to presentations at national scientific meetings or publications in scientific journals. Biology faculty also work closely with research projects in chemistry. To learn more about your STEM-related career and gain valuable experience while pursuing your undergraduate degree, explore doing an internship.